The Kendall County Forest Preserve District offers birthday party programs for children at multiple locations. Each party features activities, games, crafts, and use of indoor space for your celebration. Parties include Environmental Educator led activities, a craft, outdoor activities if hosted at the forest preserves, or indoor nature center activities at the Kendall County Historic Courthouse. Space is also provided for gift opening, cake, and parent led activities. Click here to read more. Read our birthday party contract. 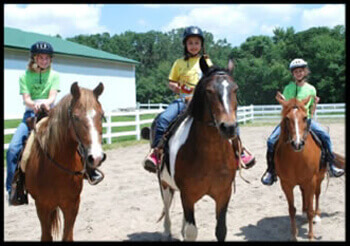 Equestrian-themed birthday parties take place at Ellis House and Equestrian Center in Minooka, Illinois. Click here for equestrian-themed birthday party program options. Our Horse Birthday Parties are 3 hours of FUN! The first 2 hours are hosted by us and include a horse-themed craft, grooming the horses and a pony ride for each child! The last hour is for you to use our classroom as you see fit! (Most often people will use this time for gifts, cake and ice cream). Want to add to the fun? Please consider one of our optional add-ons! If you have questions, or would like to register for an equestrian-themed birthday party program, send an email to Nicole Norton at nnorton@co.kendall.il.us or call (815)475-4035 office or (630)918-0364 cell. Learn more details about Kendall County Forest Preserve District Field Trips or Scouts Outings! Nature-themed birthday parties take place at Hoover Forest Preserve, the Historic Courthouse and Laws of Nature Interpretive Center, and Harris Forest Preserve in Yorkville, Illinois. Click here for nature-themed birthday party program options. If you have questions, or would like to register for a nature-themed birthday event, send an email to Emily Dombrowski at edombrowski@co.kendall.il.us or call 630-553-2292.